The life of a pirate, it ain't fit for a dog! After 20 years of sailing through the seas of the globe, it was Captain Swallow's bitter conclusion. If only he could seize a large treasure and leave to live quietly and peacefully on a faraway island! "And what if I increased my raids to amass doubloons and leave piracy behind?" wondered the tired pirate one day. But that was without counting on the fierce competition from captains Stanley, Rackum, Dirk Chivers and consorts, greedy and cruel enemies who would, as always, attack the same ships as he would. This time, he had no choice... He had to be the wiliest pirate to finally retire on a sunny beach! Outwit the plans of competing pirates over three campaigns while using the same crew cards as your comrades! Will you be able to make the most of the abilities of your characters at the right time, or will you have the loot snatched from under your foot by a wilier pirate than you? Dive in and prove your knack for tactics! ,p>Do not be deterred by the publisher's blurb and its mention of Captain Swallow with its echo of another bird-named pirate of film and computer game fame and is that Captain Barbossa confronting us on the gamebox!? The only similarity is that both take a distinctly irreverent swipe at the "Aar, JIm lad" genre. A game for up to 6 players. 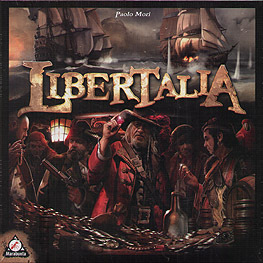 You get a playing board that contains a top-down view of the deck of the good ship, Libertalia, a variety of tokens indicating the booty for your pirates to gain, an excellent deck of cards, which are the heart and engine of the game, some very solid doubloons in different denominations and six player mats which contain a very useful explanation of the booty that you are going to keep there. Though perhaps a little pricey for the contents and a very light game, it is great fun. Each player's deck of 30 cards is identical and includes every character of the swashbuckling parade from the bosun to the mutineer, the cabin boy to the gunner, not forgetting the parrot! The game has three turns with six rounds in each turn and takes about an hour to play. At the beginning of each turn, one player will select nine cards from their hand and every other player will play with the identical set of cards from their own deck. Each round has four phases: Sunrise, Day, Dusk, Night. In the first phase, you will simply play one card face down and then these will be turned face up and ranked from highest number down to lowest accoridng to the large coloured number in the top left of the card. As several players will undoubtedly have played the same numbered card, their order is further determined by a second smaller number that differs from one player's deck to another. Next, in the Day phase, you will resolve in ascending number order the text by the sun symbol on the card. These events will bring good or bad fortune down on yourself or other players. The third phase involves taking booty, this time in descending number order and in the final phase any cards that have a moon symbol will have their text resolved. At the end of your sixth round, any cards that have an anchor on them will be resolved, the value of your booty and doubloons collected is totalled up and this is your VP score for the turn. All booty and doubloons are then discarded and each player starts off the next turn with a stake of ten doubloons. At the core of game play is second guessing your opponents and here I would strongly recommend a timer if you consort with any fellow pirates who suffer from analysis paralysis! There is plenty of opportunity for putting a shot across an enemy pirate's bow, but beware because he or she will be likely to do the same to you. Play is swift and suitably cut-throat for the theme. I would strongly recommend this game, with the proviso that you really need 5 or 6 players to get the full value out of the game.